Benefits vary with cruise duration — and the value of the chosen USB collection. 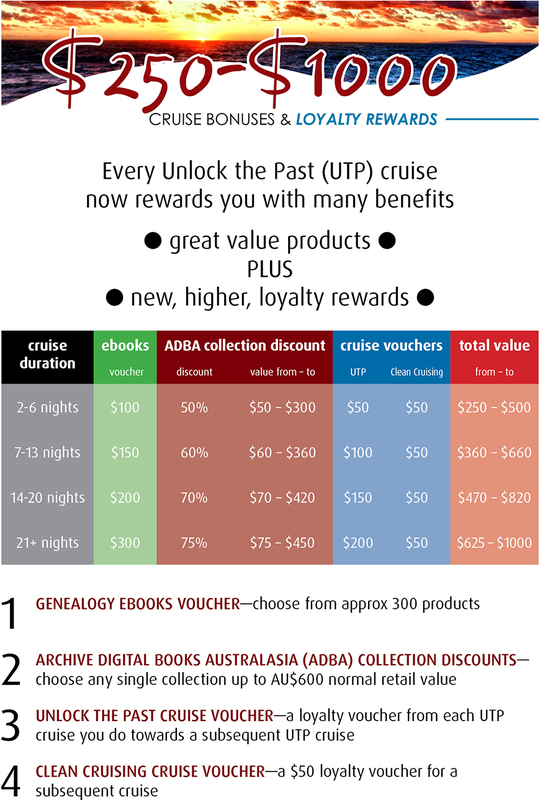 GENEALOGY EBOOKS VOUCHER—supplied on the cruise to your USB drive* — or one loaned for transfer to your laptop on the cruise. Currently there are approx 300 products on Genealogy ebooks to choose from, but this number increases each month. Visit the web site — www.gen-ebooks.com — for the full list currently available. ARCHIVE DIGITAL BOOKS AUSTRALASIA (ADBA) COLLECTION DISCOUNTS—choose any single collection up to AU$600 normal retail value. For supply on the cruise to your USB drive* — or one loaned for transfer to your laptop on the cruise. The value to the user varies, depending on the value of the chosen product. Currently there is a choice of 52 products. Go to www.gould.com.au/usb for a full current title list. UNLOCK THE PAST CRUISE VOUCHER—a loyalty voucher from each UTP cruise you do towards a subsequent UTP cruise (for your use only). One voucher may be used for any one future cruise. Any previous loyalty benefits accrued may be used for your next cruise, but the new benefits will supersede these once they are used. Go to www.unlockthepastcruises.com/cruises for currently booking cruises. CLEAN CRUISING CRUISE VOUCHER—a $50 loyalty voucher for a subsequent cruise booked with Clean Cruising, our cruise travel agent. This voucher may be used on any one future cruise booked with Clean Cruising—not just an Unlock the Past cruise. * If you don’t bring your own USB you may purchase one from us onboard—or alternatively transfer to your laptop on the cruise via a loan USB drive. ebooks and ABDA collections offers must be supplied on the cruise, though we expect to provide an order form for you to submit your order prior to the cruise. benefits apply to the first two people booked in anyone cabin. cruise vouchers are available for speakers to use on any subsequent cruise they do at their own expense. prices are in Australian currency (AUD). Click here to see cruises currently booking—and others under consideration.